Goalkeeper Ben Hinchliffe is determined to keep his place after returning to AFC Fylde’s team for Saturday’s 2-1 victory at FC United of Manchester. Hinchliffe had lost his place in Dave Challinor’s starting 11 to Matt Urwin in recent weeks, but was recalled at Broadhurst Park due to his rival’s injury. Hinchliffe pulled off a sensational late save to secure all three points for the Coasters and is keen to retain his place for Saturday’s home clash with Nuneaton. The keeper said: “It was great to be back in the team because I always want to play. Matt has come in and done very well recently, but he picked up a bit of an injury and that gives me a chance now. “It made it all the sweeter to come back for such a big game, and even more so to come away with three points. “A lot of the top teams have struggled there. It can be difficult for lads who haven’t played in front of big crowds but I thought we coped with it well. Defensively we were very solid and that made it a lot easier for me. We managed the game well. “It was important to get the first goal, and Danny Rowe scoring early in the season half relieved a bit of pressure on us. “They upped the pressure in the last 10 minutes after they scored, but they are always going to do that when they are chasing the game. “I didn’t really have that much to do, so I tried to keep myself busy talking to the lads, organising them and making sure I was always switched on. “In a quieter, less intense match, sometimes it’s more difficult to stay alert but not in an atmosphere like that. “I definitely want to keep my place now but Matt will tell you the same thing. It’s my job now to make it as difficult as I can for him to get back in. “We bounce off each other well and do whatever we can to help each other out. We are both here for exactly the same reason – we want to get Fylde promoted. 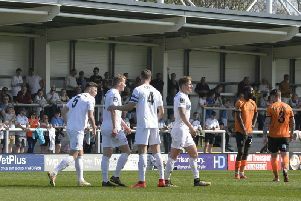 Three successive wins lifted Fylde to second in the league. However, they still trail Solihull Moors by nine points, and although the leaders lost 2-1 at home to FC United of Manchester last night, Hinchliffe said: “I don’t think Solihull are going to drop the points we need them to, but we still want to push them right to the end and I don’t see any reason why we can’t win every game.